This is the syllabic and roman spelling of the word entry. This line indicates the part of speech as well as other grammatical information relevant to the entry. This section provides the English and French definitions of the entry. Some entries may contain examples. Each example is displayed in syllabic and roman and contains translations of the text in English and French. 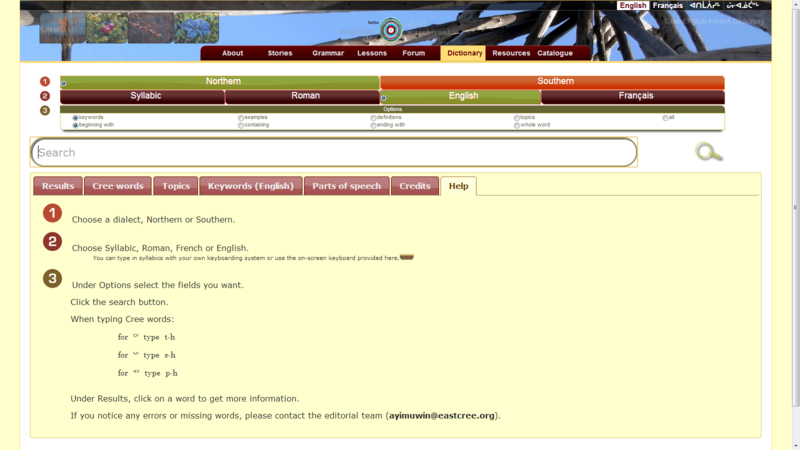 This section provides the English and French keyword(s) for the entry. This section provides the topics or theme of the entry. If we have an image for the entry it will be displayed. We may also have audio recording from various communities which will be displayed as seen in the image above. 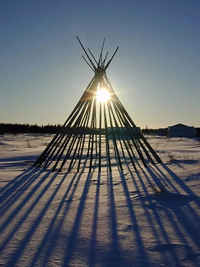 You may then click on the button to hear the audio recording of the Cree word. Below are the abbreviations representing the communities for which we may have audio recordings. First, make sure the interface language currently selected is the one you want. The interface language will determine the language on the various buttons throughout the site, as well as the language of the search results. Next, you must choose the dialect of Eastern James Bay Cree in which you would like to search and browse (the dictionary has two: Northern and Southern). You will notice that the dialect button you selected now has a green background, while the other has an orange background. This is a visual cue to let you quickly see which dialect you’re working with. syllabics, the dictionary will search all of the syllabic fields in the database (i.e., it will not search for any words written in roman or English/French). **Note that if you select this option, you must also type in syllabics. 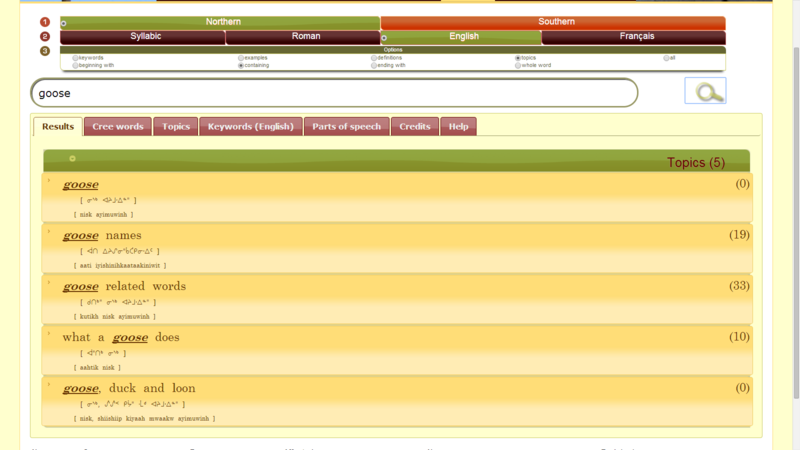 roman, the dictionary will search all of the roman fields in the database. 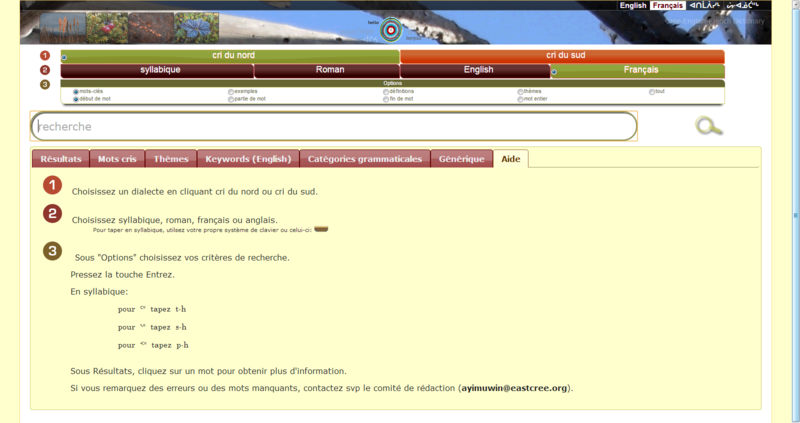 English/French, the dictionary will search all of the English/French transliterations in the database. You will notice that the language/form of writing you select now has a green background, while the others will have a dark brown background. This is a visual cue to let you quickly see which language you’re searching in. This section allows you to refine your search parameters. You can either expand or narrow your search to generate the results you want. The first row, in conjunction with the language/form of writing you selected, will tell the dictionary which fields it must search in. keyword: if you selected English or French, selecting keyword will run a search on all the keywords and glosses in the database. 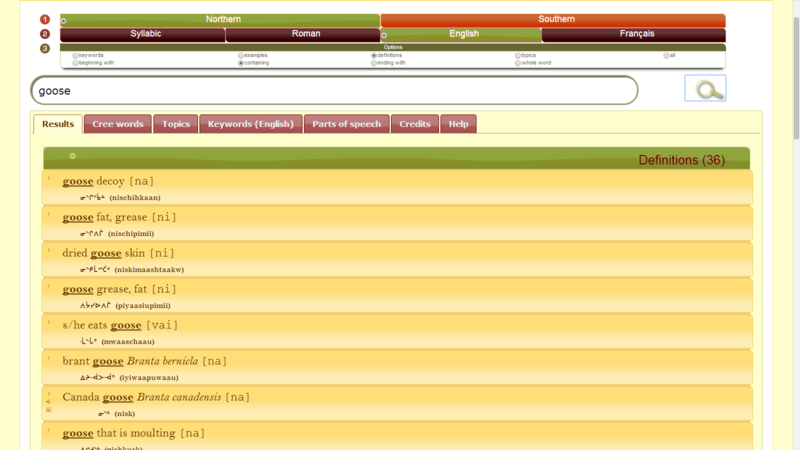 If you selected Syllabics or Roman, the search by keyword will be performed on the headword of dictionary entries. definition: the dictionary will search all English and French definitions for the word(s) you typed in the search field. example: the dictionary will search through the examples or example translations of the entries for the word(s) you typed in the search field. 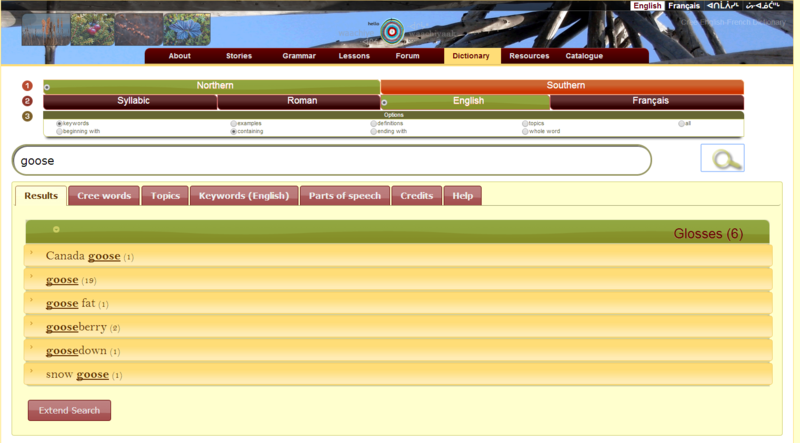 topic: the dictionary will search through the topics or themes for the word(s) you typed in the search field. beginning: when this option is chosen, the search will return XYZ, where X is the beginning of the word, Y is the middle, and Z is the ending of a word. whole word: when this option is chosen the search will return XYZ. The spelling must be exact to use this option, otherwise you will get no results. If you know the spelling of the Cree word you are looking for, you can perform your search by using either the syllabic or roman orthography of the word. To type using the syllabic orthography, you need a virtual syllabic keyboard like “Keyman” (see https://www.eastcree.org/cree/en/resources/how-to/cree-fonts/). If you don’t have a syllabic keyboard, you can use the built-in Flash-based keyboard to type in syllabics (you need Adobe Flash Player installed). You can active it by clicking on the keyboard icon in the typing field. 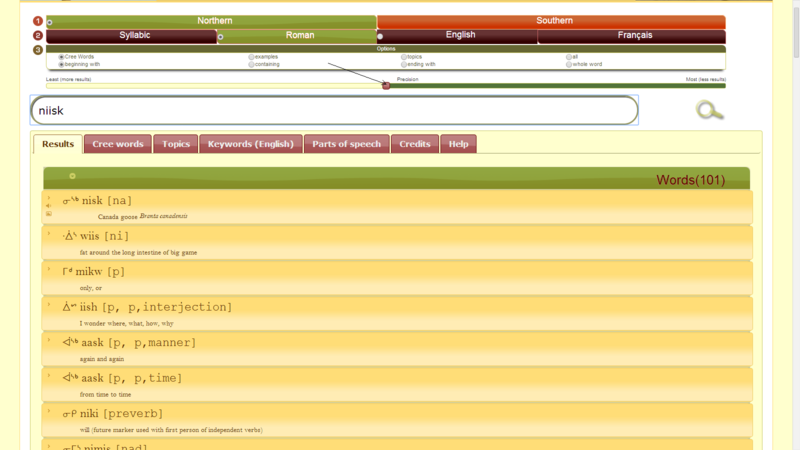 Our dictionary has a built-in Cree spellchecker which allows you to control the precision of the returned suggestions. The more precision you choose, the less results you get. our spellchecker (the relaxed search engine) automatically gets activated. By default, it is set to be as precise as possible to return the fewest results to match your search query. If you reduce the precision, you will get more results. This is useful when your margin of possible spelling errors is large. If you want to find the East Cree word for “goose” in our dictionary, you have few options. Below, you will see how the search works in combination with the various options to provide different results. Note how Options 1a, 1b, and 1c use beginning / containing / whole word, respectively, to produce different results.